The weather in Southeast Michigan has been crazy this year, ranging from the freezing 30s to the blistering 90s seemingly overnight. We skipped Spring and jumped from Winter to Summer! Has your car been affected by having to switch from the heater to the air conditioner rapidly? No worries! Come on into Mr. Muffler and we’ll check the condition of your air condition and repair whatever you need to be repaired! Check out our summer specials! We have a radiator coolant flush starting at $49.95 (price fluctuates with car make and model). And we have a thorough A/C check-up starting at only $19.95! Don’t suffer through the summer’s heat in silence. Come to us and we will fix your air conditioner at a great price! Want to fight the Summer Heat with a little Summer Car Maintenance? Put up a sunshade or window visor every time you exit your car to keep the interior cool. Keep it even cooler by putting a sunshade in your rearview window as well. Block the sun’s rays from your car! A fabric or upholstered dash cover can make your car’s interior more comfortable and a lot less hot. You won’t feel as overwhelmed by the heat if you don’t have to touch hot vinyl and leather surfaces. So, whenever possible, park in a shady area. You’ll be happy to enter a not-so-hot car when you return from your being away. While it’s not a good idea to leave your windows all the way open, it is a good idea to leave them slightly cracked. Even the smallest crack will promote ventilation and help to keep your car from overheating. Feel free to contact us with any questions you may have! Come to visit us today at 125 S. Wayne Rd. in Westland, MI or call us at (734) 721-2800. We can’t wait to hear from you! Can Your Car Keep You Cool? Although we aren’t quite there yet, summer is coming soon. The last thing you would want to do is get stuck driving without air. Air conditioning provided cool air that is. If you turn on your car’s air conditioner and it seems to be blowing out warm air or only slightly cool, it may be time for an AC recharge. Because the summer heat hasn’t arrived it is the best time to save big on AC recharge at Mr. Muffler. What is an AC Recharge? 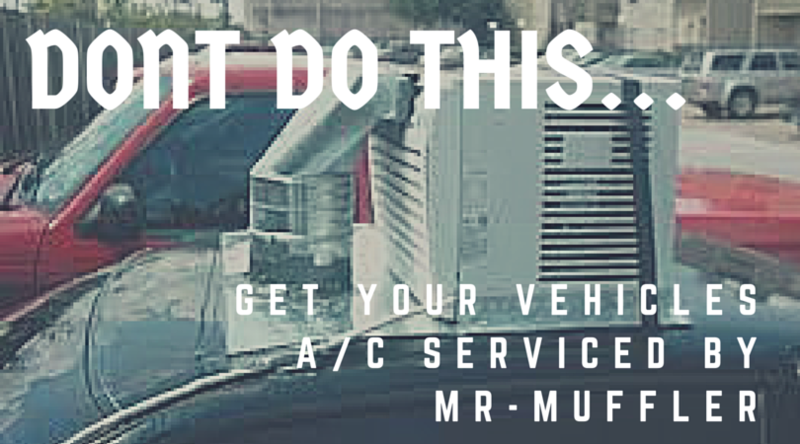 When you bring your car or truck to Mr. Muffler in Westland, Michigan for an AC recharge you can be sure your car will keep you cool come summer time. An AC recharge consists of checking the pressure of your air system, ensuring all fluids are full and find any leaks using a special Dye leak detector. The refrigerant that creates cool air within your car’s air conditioning system does not just evaporate. So, if your fluids are low or you feel as if your air should be cooler, it is highly likely that you have a leak somewhere. Our professional auto repair technicians will find the source of the leak and inform you of any necessary repairs. Because Mr. Muffler is a full-service repair shop in Michigan, we can service all necessary repairs in and around our Westland location. When do I need an AC Recharge? There is no set schedule for getting an AC recharge. Typically, car owners can feel that their air is not properly working. This signals them to come in and schedule necessary services to repair the air conditioner in their vehicle. We do recommend, to test your air every once in a while even in the cooler seasons, as you can save a ton of money if repairs are needed. Be sure to ask us about our April and May AC recharge specials when you contact us today! Now is the time, we are finally seeing the warm weather break here in Michigan. We want to let our customers know it is better to check and treat your vehicle’s air conditioning system to prevent further major repairs. Your vehicles AC system may need a recharge. Drivers need to make sure your refrigerant is not low. If it is, this could be due to a leak. If your air conditioning system operates on low refrigerant it will, in time, damage the compressor. Check for preventive care. Filling the refrigerant and fixing a leak is going to cost much less than if the air conditioning compressor gets damaged and needs to be repaired or replaced. If there is a noticeable noise and less cold air coming from your air conditioner when your car is running it could be faulty fan or the blower of your air conditioning system. If a stale smell is coming from your vehicles air conditioning system this could be telling you something is wrong. Components that contribute to air conditioning system failure are; clogged evaporator, compressor, expansion vale and condenser. We know that to some people air conditioning is not first on their list, but keep in mind the main advantages of a vehicles air conditioning system is preventing driver fatigue. Drive Safe! We Service the Westland MI, Wayne, Garden City, Canton, Plymouth and surrounding areas. Call Us 24/7 at 734-721-2800 or Contact US anytime for A/C Repairs and many other car repair services.